Flowers are blooming, birds are singing, the scents of spring are filling the air. Now take off your winter coat and rock your day with a light and airy new look. Let's go out and have fun! Beep beep! You've got a text! It seems your friends can't wait to hang out with you. Hmm~ the season is calling. It would be so nice to go outside for some fresh air and step into the season in a refreshing new look. 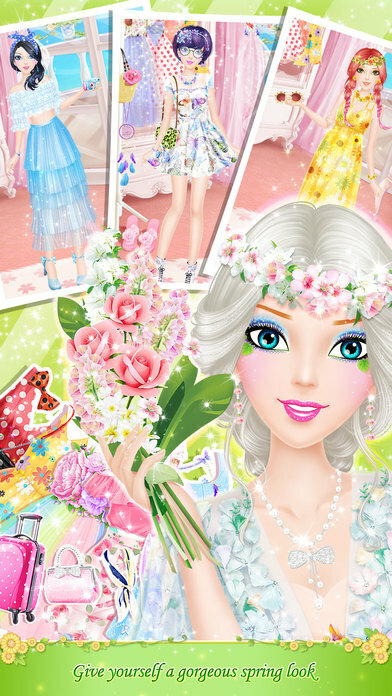 Give yourself a perfect-for-spring makeup and put on your favorite dress, let’s go hiking and visit the flower field. Heigh-ho, heigh-ho, we're off to the fun. Open the game and get ready for a fancy outing. Let's go to the makeup room first and make your face glow: pop some glitter on the eye, add a little cheer to your cheeks with a sweet blush, and give your lips a perfect healthy glow... Then go to Libii Mall to get your bibbidi bobbidi boo look. Who do you want to be today? Elegant lady or casual sweetie, sweet girl or cool fashionista? Ask your friends for advice and make it happen. Are we all set? Let's go embrace the season right away. Smell the sweet fragrance that fills the fresh air and share the laughter with your friends. That's the feeling! Now take a picture and capture the beautiful moment. Hey, everybody. Say cheese! The first outing is fantastic, and your second one will be even better. We have a charming boutique that offers a wide variety of cool stuff you may need for a lovely outing. Let's go and prepare for your next trip!